Our Door Dresser is one of the many designs representing George Vanderbilt's masculine taste shown throughout Biltmore House. The base caps and linear design are inspired by the wonderful architectural elements of the woodwork and stonework of the moulding trim in the house. 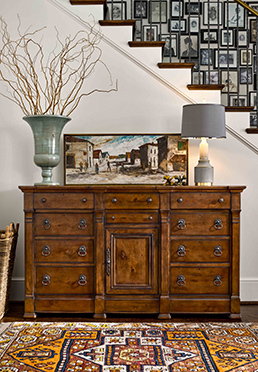 The beautiful piece has one door, ten drawers, one felt-lined jewelry tray and an adjustable interior shelf.